Athena Tacha is a multimedia visual artist. She is best known for her work in the fields of environmental public sculpture and conceptual art, but also works with photography, film, and artists’ books. Tacha’s work is interested in creating personal narratives, and often plays with geometry and form. 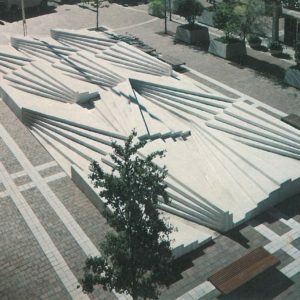 One of the first artists to develop environmental site-specific sculpture in the early 1970s, Tacha has won over fifty competitions for permanent public art commissions, of which nearly forty have been executed throughout the U.S., including an entire city-block park in downtown Philadelphia. 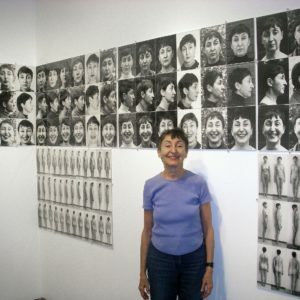 She has had six one-artist shows in New York—at the Zabriskie Gallery, the Max Hutchinson Gallery, Franklin Furnace, the Foundation for Hellenic Studies, and the Kouros Gallery – and has exhibited in numerous group shows throughout the world, including the Venice Biennale. Concurrently, she produced a body of textual and photographic conceptual works, many of which were published as artist’s books. Athena Tacha’s artist books are conceptual and often poetic studies that were printed between 1970 and 2005. An interactive online display of the artist books and other printed materials can be found at Printed Matter, Inc.The pocket books series are small folded books, similar to a zine that were often sold in a plastic sleeve. In The Way My Mind Works, Tacha writes about her schizophrenic mind, her ruminating mind, her orderly mind. Others in the pocket series examine everyday life. The larger artist books focus on geometry, space, and minimalism. A Dictionary of Steps displays diagrams of steps. In addition, Tacha explored self portraiture, in works like Gestures and Expressions.